When advertising for your latest city event or holiday celebration, you can ensure that your street banner stays hanging high through the season and beyond with the proper street banner hardware. BannerFlex keeps a stock of the strongest banner bracket hardware to provide our clients with a quality product that won’t let them or their banners down. Coupled with our bracket arms, you know that you can advertise for years to come without issues. 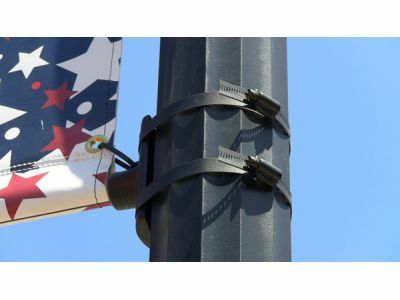 The 5/8” screw gear band from BannerFlex holds banners onto utility poles tightly and securely, so you don’t have to worry about any banner falling. With a “captured screw” instead of a quick release lock, no matter how much snow might fall onto your street banner hardware this holiday season, you know your street banners will stay held up. Crafted with thick stainless steel, the screw gear band from BannerFlex won’t let you or your hardware down. 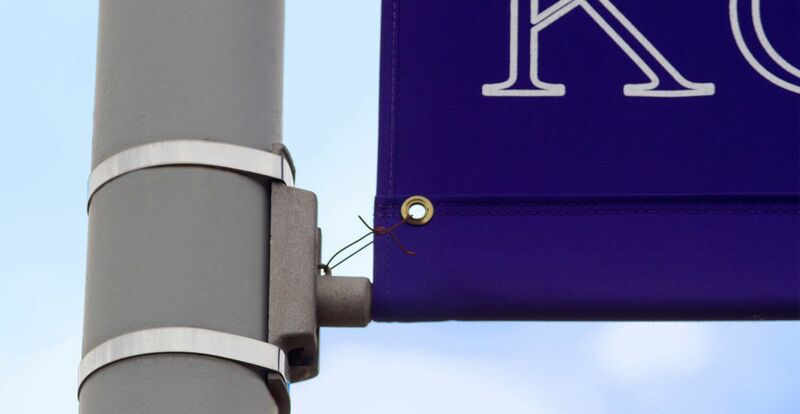 When you slide your banner onto your street banner hardware, you can go the extra mile when securing it by attaching it to your hardware with our 10” gauge wire tie. Rather than using a zip ties or string, BannerFlex offers a steel wire for you to secure your banners to your hardware with a stronger, more durable material. No matter the winter-weather conditions, your banners will stay tied strong to your banner bracket hardware, and you won’t have to worry about loosening. With banners sold all around the country, you know you can trust Kalamazoo Banner Works to provide the quality advertising products you’re looking for. With over 30 years of experience in delivering banners and hardware that can stand up to the elements, you know that your city utility poles will be decorated in a secure and safe way. With an art department ready to get to work on your banner’s design, see what we can make for you today!